Last week I challenged myself to account for every hour of the day in order to better understand how I spend my time. I am not the first to come up with this idea, the Bureau of Labor and Statistics has been publishing a similar survey since 2003. This entry was posted in Organizing: Time and tagged blessings, Bureau of Labor and Statistics, organizing, time, time management on June 30, 2013 by Organizational Specialist. Who doesn’t love a fun gift bag? These were made for a school reunion and were inexpensive and fun to put together. 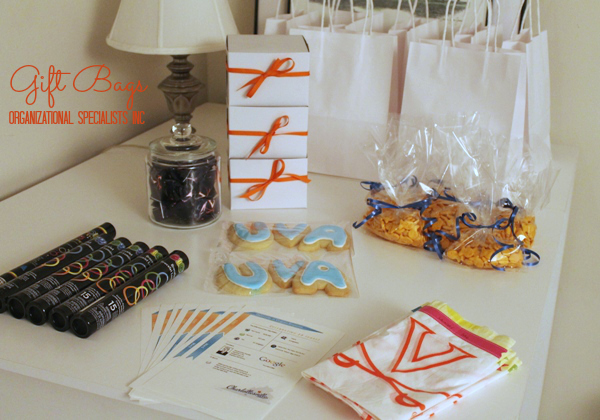 This entry was posted in Event Planning, Organizing: Situations and tagged gift bags, goody bags, organizing, reunion, school, UVA on June 26, 2013 by Organizational Specialist. This entry was posted in Organizing: Time and tagged challenge, Downton Abbey, Jimmy Fallon, time management on June 24, 2013 by Organizational Specialist.